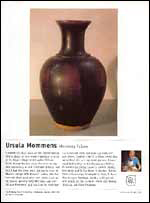 A passion for pottery is nothing without the many guides and references that are published to help the enthusiast. We have introduced this book review page to assist collectors and potters in their research for information. We invite authors and publishers to submit material that they believe would be useful to our happy band of ceramics surfers. Previously published as Potters. Twelve publications from 1972-2000. A compact 1st edition of The Ceramics Book, beautifully presented with photographic examples of the recent work by 281 specially selected potters, all of whom are members of the Craft Potters Association of Great Britain. 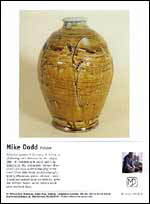 Along with the photographs of recent work there is information about the potters and their contact details. The potters are presented in alphabetical order, each to a page, and their page includes a small recent photograph and the mark that is used on their pots. A blue section at the back of the book contains all addresses, telephone numbers and in some cases web addresses. This section has details of 344 potters. It also includes a map of Britain and pinpoints where the potters can be found. 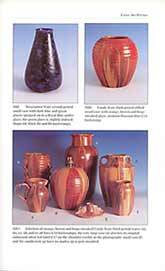 On the last page there is information about the Craft Potters association. When I received The Ceramics Book my first thought was "why change the title and size of a much loved and eagerly awaited new edition of Potters?" I have not changed my first thoughts but have to say that those who enjoyed previous books from the Potters series will not want to be without this one. It is every bit as good (except that it doesn't sit neatly in the bookcase with the others) and having the contact details on the potters' pages is a welcome improvement. Ceramics in general terms covers a wide range of acitivities and subjects so perhaps the CPA's marketing people think this new title and format will appeal to a new wider audience; I do hope, though, that the wonderful body that publishes this book will not change its name to 'The Craft Ceramicists Association' - that would take some getting used to! It has 320 pages measuring 4¾ inches by 4½ inches and something approaching 600 pictures excluding the potters' marks. You will not want to be without this inexpensive but very informative book. The aim of David Ash's book is to provide a framework of reference for collectors and dealers to identify the numerous styles and wares that Bretby produced during their long history. This he does more than adequately. He begins with a brief history of the company and a short biography of Henry Tooth -- the man behind the company. The following chapters have descriptions of the wares listed in alphabetical order from Applique to Zuyder Zee. The entries are carefully researched, much of the information having been painstakingly gleaned from issues of The Pottery Gazette (later to become The Pottery Gazette and Glass Trades Review ranging from 1884 to 1956. Included towards the end of the book are chapters on dating by means of the shapes, pottery marks and numbers used. There is a useful and well laid out table giving a 'timeline' showing the length of time that each design was used, e.g. Clanta 1915-1933. An interesting and informative book which will help identify many pieces that due to the lack of a clear mark were a mystery. It is essential reading for any Bretby collector and of great interest to any lover of art pottery. It has 88 pages measuring 5¾ inches by 8¼ inches with 42 colour photographs and 2 monochrome. This charming little book was written at the request of Brigitte Appleby with material that she had gathered herself. 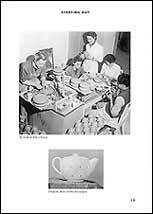 Anthea Arnold has produced an easy and enjoyable read about the Briglin Pottery from its start in 1948 to its closure in 1990. It recalls the aims of the two 22 year olds Brigitte Appleby (nee Goldsmith) and Eileen Lewenstein (nee Mawson) when starting out and the instant success of the pottery. There are many photographs showing every type of work produced at the pottery through the years including the theatrical figures made for Briglin by Susan and Richard Parkinson and also the Goon figures originally designed by Peter Sellers. The book is divided into chapters, each dealing with a phase of the company's evolution, and there is a chapter dealing with the birth of The Craftsmen Potters Association in which Briglin played a leading role, and the start of Eileen Lewenstein's long association with the organization and its organ Ceramic Review of which she was co-editor with Emmanual Cooper. This is one of the best accounts of the life of a pottery that I have read and it makes me wish I could turn back the clock and train there myself. It has 76 pages measuring 6¾ inches by 9½ inches. Wetheriggs Pottery, A History amd Collector's Guide is a nicely illustrated book showing examples of the pottery produced from 1855 to the post 1973 period. Half the book is text about the pottery and its people including Harold Thorburn's account of his life at the pottery and the history and family tree of the Schofields. The following two sections give details about the pots and the marks that have been used over the years. This first half of the book is well illustrated with monochrome photographs, including some very early ones, but not at the expense of the very informative reading matter. The second half is composed of illustrations, nicely laid out with four pots to a page, and each with a short description. It is divided into three sections: Unmarked brown ware from mid-19th century, Sponged ware / Agate ware and Coloured ware pre-1973, and Coloured ware post-1973 (unglazed bases). Not all items from this pottery are marked so this book is a very good guide for the collector to identify and date pieces. It has 104 pages measuring 6¾ inches by 9½ inches. Maureen Mackey wrote Experience Clay as a classroom guide for ceramics teachers and students. It covers not only the technical aspect - techniques, skills and tools - but also approaches the subject from the aesthetic and historical perspectives. The reader is taken through the topic from beginning to end - this is a complete course - and the chapters progressively cover clay, tools and equipment, design considerations, hand-building, throwing, handles and spouts, decoration, glazes, and kilns and firing. 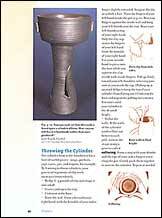 Each discipline is illustrated with step-by-step photographs and diagrams, and pictures of finished work by master potters show the student how experts have approached the task. The author has put equal emphasis on technique and creativity to highlight the importance of discipline and self-expression. Although written primarily as an academic coursework guide, the book will be of interest to all aspiring potters, and even those who don't want to get their hands dirty but would like to know how things are done. There are 200 pages measuring 8¼ inches by 11 inches, many photographs and diagrams on nearly every page and some useful appendices. Mr Bartlett's book covers the period from 1870 to 1940; from the mid-Victorian era of prosperity and high industrial output to World War II. In the preface and introduction he provides background details about types and styles of ceramics produced in this period and gives hints on how to identify them. 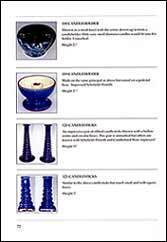 The author gives concise and well-researched information about nearly seventy potteries and potters, presented alphabetically. Each entry is divided into sections; historical background, products, marks and suggestions for further reading. As the headings suggest, these sections give names and dates for the setting up and major changes in production; details of the ranges and styles produced; a table giving marks, names, signatures and dates they were used, and a comprehensive list of other books about makers with details of museums and galleries where their work can be seen. The book is lavishly illustrated, and if you enjoy looking at the pictures on this site you will love browsing British Ceramic Art. There are 335 photographs, most of which are in colour. Appended are a glossary, a section on registration marks and one on registration numbers, a price guide and a four-page bibliography. There are 240 pages measuring 8½ inches by 11 inches. British Ceramic Art has long been one of our first points of reference and we thoroughly recommend it. The Designs of William De Morgan is a well illustrated book with a minimum of text and a wealth of designs. 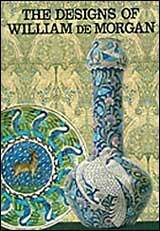 This publication gives a brief written account about William De Morgan, his pottery and his designs. 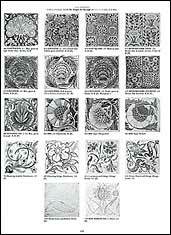 As I have suggested, the majority of the book is illustrated showing his dish, vase and tile designs. 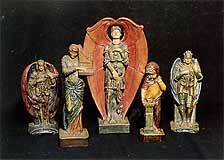 It also shows the designs of Halsey Ricardo who was De Morgan's partner from 1888-1898. The page we show on the left is one of many showing tile designs. Approximately two thirds of the illustrations are black and white the rest are in colour. It includes a page of marks used by the pottery throughout its existence. This is a very well presented book that I never tire of looking through. It has 256 pages and, at a guess, something over 1,500 illustrations. At 9 inches by 12 inches it is not a book that you would want to get out on a crowded train. Whether it is from a sense of nostalgia or a feeling that what we (or our parents) once thought of as fashionable has passed through the phase when it was considered passée and can now be appreciated for its design and aesthetic merits, ceramics, and indeed many other twentieth century artifacts, are now very popular. The book covers British and North American makers and as is the case with other publications from Miller's Twenieth-Century Ceramics cannot be accused of being short of content; it would not be easy to find a ceramics manufacturer who has caught the collectors' eyes that is not represented in these pages. Nearly all of the entries are illustrated, many with details about marks used, and all with a short history of the company. The makers are presented alphabetically so there is hardly a need for an index although a generous one is provided. There are also lists at the back headed: Glossary, Where to buy, Where to visit, Collectors' Clubs, Bibliography and Key to prices. There has been no discrimination about the types of ceramics that are included so you will see everything from full-blown art potteries like Ault and Bretby through fancy china companies such as Royal Crown Derby and Royal Albert to the stalwarts of 1950s and 60s domestic wares, Midwinter, Hornsea and the rest. This very readable and useful book has 272 pages measuring 7¾ inches by 10¼ inches and well over 500 colour photographs. An interest is not worth having unless it is to some degree obsessional. Fortunately, once in a while an individual has both the very keen interest and the ability to produce a book that will give others all they need to know on the subject of that interest. Such is the case with Ian Turner and Candy Art Pottery. A complete history of the company is given from the time Frank Candy founded it, through the periods when it was producing Wescontree and Candy art pottery to the time it ceased production of these lines. The history is well documented with contemporary photographs and reproductions of drawings and documents. The wares are described with colour illustrations of pots from the authors collection of over 100 items and some original advertising material. Following chapters deal with the people involved in the making of the wares and the marks used. The appendices, which take up the last third of the book are reproductions of four catalogues, all well illustrated, identifying the shapes (by number) and the sizes they were made in. These pages are intriguing, and although mainly in monochrome some pages are in full colour and beautifully stylish. The book has 74 pages measuring 7 inches by 10¾ inches.